Are you a nurse or know someone that is? If so, then you�re aware of the vital role they play in healthcare and patient care. 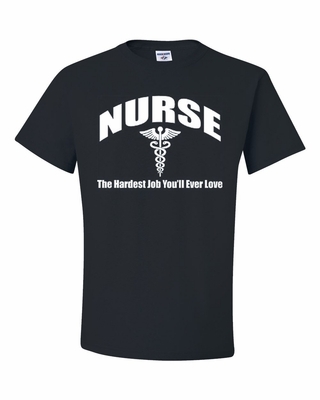 Show your appreciation to the long hours and emotional work of nursing with our Nursing- The Hardest Job You'll Ever Love T-shirt. If you are a nurse, the hardest job you�ll ever love is also one that saves lives every day. Celebrate your hard work and your role in patient care with this comfortable and inspiring T-shirt. We appreciate you. Remember� you found the Nurse-the Hardest Job You'll Ever Love Shirts at TShirtHub.com, where high quality came at a low price.